GARDEN CITY, N.Y. — Former Yankees outfielder, Johnny Damon, is scheduled to appear on Saturday Dec. 12, 2015 from 12:00 pm to 2:00 pm to meet and greet fans. The World Series champ will sign autographs and memorabilia at the Steiner Sports Store located in the Roosevelt Field Mall in Garden City, NY. For more information, click here. 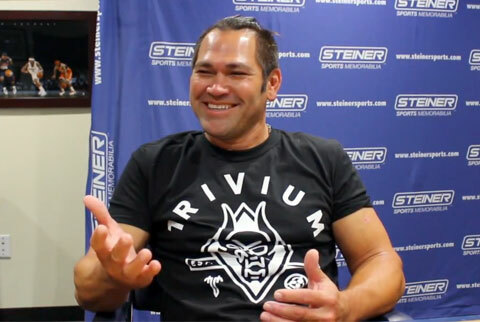 Watch Johnny Damon speaking with Steiner Sports about his favorite Yogi Berra story. Johnny Damon began playing MLB in 1995. He last played in 2012, though he has not officially retired. In his MLB career, Damon has played for the Kansas City Royals (1995–2000), Oakland Athletics (2001), Boston Red Sox (2002–05), New York Yankees (2006–09), Detroit Tigers (2010), Tampa Bay Rays (2011) and Cleveland Indians (2012). Damon also played for the Thailand national baseball team and was a member of the squad for the 2013 World Baseball Classic qualifiers. PFP Sports & Celebrity Talent Agency is a top booking agent for motivational sports speakers and celebrities. If you would like to book MLB stars like Johnny Damon for a speaking engagement, personal appearance or special event, you can request Johnny Damon agent and speaker information from PFP Sports & Celebrity Talent or call 800.966.1380.